There was a recent post over on Red Hot Liberal-On-Liberal Action which alerted me to the Inquiry into the Schizophrenia Label (ISL) , a research project that was set up in response to Professor Sir Robin Murray’s Schizophrenia Commission. Murray’s report gave 42 recommendations to improve the care of people with schizophrenia. Since Christmas is nearly on us, and the Apocalypse appears to have passed without incident, I thought I’d take some time to reflect on the past year. Last Christmas, The Not So Big Society was only a couple of months old. Prior to starting the site, both Ermintrude and I had been running successful blogs that we’d felt compelled to shut down due to people causing trouble for us in meatspace. As result we’d both found ourselves at something of a cyber-loose end, and agreed to set up a blog together. Since then we’ve been joined by other writers, including Abe Laurens, Politicalnurse, Gary, Bonkesoul and Z3r00n3. I like to think we’ve evolved nicely into a forum of ideas and opinion about health and social care, with the occasional dollop of small-p politics. Over time the readership of the blog has slowly but steadily grown, from 2,648 views in October 2011 to 14,466 in November 2012. A rather unscientific browse through our list of followers on Twitter suggests we’re being read by a healthy mix of professionals, service users, students, academics, politicians, campaigners and interested individuals. We also get a steady stream of angry, at times abusive, messages from people who believe that social workers are engaged in a massive conspiracy to steal children. If I’ve learned one thing this year about building up a readership, it’s that quality is as important as quantity. In terms of how people are finding us, the most popular search string (apart from the obvious like “not so big society”) is, believe it or not, “tin foil hat”, probably due to this post. The most popular sensible and non-obvious search term was “AMHP training”. There’s also a very high number of search hits for information about the John Smalley case, which I used to demonstrate how appallingly under-regulated the psychotherapy industry is. I suspect this may be because although it’s not a huge issue in terms of widespread media interest, there’s not many other places highlighting this problem. Oh, and hello to the small number of you who found us with the following search terms. This time last year, the spending cuts that followed the credit crunch were yet to be fully implemented. Now we’re beginning to feel the full impact, very possibly with more to come. I’d vaguely hoped that austerity would prompt a greater sense of compassion in society, that we would feel compelled to spend more time looking after our friends and neighbours in order to protect the vulnerable. In fact the opposite happened. This year has seen a ramping-up of unpleasant rhetoric that tars and feathers the poor, the sick, the unemployed and those who work with them. Disabled people are all faking it. If you’re unemployed it’s been you don’t want a job rather than because you can’t find one. The poor need to be given vouchers instead of money so they don’t spend their benefits on fags and booze. Nurses are all lazy and compassionless. Social workers are all loony-left ideologues. Our political classes may not have been responsible for the financial crash, but they are responsible for turning the struggling masses against themselves. I’m more angry at the government and the world in general in my mid-30s than when I was a stroppy, immature teenager. What’s that about, then? If there is a Christmas message from this blog, I hope that it is this: despite what Margaret Thatcher claimed, there is such a thing as society. If there is a true measure of society, it is the way it behaves towards those in need of care and support. We did not create the ongoing austerity, but we live with it and face the consequences every day. We are the have-nots rather than the have-yachts. We believe in compassion and decency, and we oppose stigma and victim-blaming. We are the Not So Big Society. 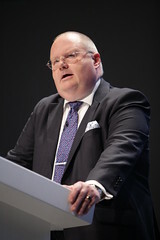 Yesterday, Pickles announced a cut of 1.7% spending for local authorities. On top of cuts which have taken place already, this leaves many public services in a precarious position. Local government has been hit hard already by this government and the austerity measures taken and while Pickles and his ilk in the Cabinet like to promote the impression of profligacy in the public sector, the cost is made in terms of quality of life and vital support services to some of the most vulnerable in the country. “Councils must do three things to get on the right road for their residents: put our fair funding deal to work; do every single one of our 50 ways to save; and accept our council tax freeze offer. Councils that cry wolf without having done all of this are letting their residents down. So this is ‘localism’ at play. I thought I’d take a look at Pickles’ 50 ways to save. They are available to view here (PDF). I’m just going to look at a few of them and there does seem to be a theme. For a government document there is some very political language lurking inside Mr Pickles’ suggestions. Firstly he talks of ‘sharing back office functions’ and praises initiatives like the ‘tri-borough’ linking of some functions between Hammersmith and Fulham, Kensington and Chelsea and Westminster as well as giving other examples where this has been the case. While there may be scope for some services, the assumption that ‘back office’ is unnecessary can be dangerous. My understanding is that the cuts in staff do not limit themselves to ‘back office’ and the blurring between ‘frontline’ and ‘back office’ can be dangerously shaky at times. Another of his suggestions is – and I quote because I think this language is important is – ‘Claw back money from benefit cheats’. Fine, this is fraud but why is it listed separately from the other ‘tackle fraud’ point. Of course fraud should be tackled but the use of language is very different in the two points. Pickles plays on emotion here and the now familiar government rhetorical of creating and emphasising the collocation of ‘benefit cheats’. It could easily have been termed ‘tackling fraud’ but no, the government want to emphasise this point particularly. Another one is ‘encourage e-billing and direct debit’ – now maybe I’m on a different planet or maybe things are different wherever it is Pickles lives but my understanding is that this has been pushed pretty heavily already. Ah, encouraging hot-desking is there too. This works in different ways in different services. Having worked in adult social care for many years, the importance of having a team around you in a stressful environment is crucial in my opinion in terms of engendering safe practice and providing team support. This is debateable and is my own experience but I do worry about the support available if we are continually pushed towards hotdesking. ‘Close subsidised staff canteens’ – fair enough but lets close the subsidised bars in the Houses of Parliament too. Cancel away days in posh hotels and glitzy award ceremonies – this made me chuckle. The last away day I attended was in the office I worked in. My council got rid of awards ceremonies and for my ‘excellent service’ I got a £5 M&S voucher ‘to buy myself a sandwich’. I was genuinely delighted by my award because it wasn’t expected and it was something I am proud of. I’ve even kept the vouchers as a souvenir. Maybe I was never at a pay grade high enough to have the fancy away days or glitzy ceremonies but I suspect a lot of councils have cut in this area substantially already. Introduce a recruitment freeze he says. There have been some very damaging recruitment freezes which have had a direct effect on services produced. Looking again at the LA I came from the proposals included replacing all leaving social workers with unqualified replacements. Is that what Pickles wants? Or perhaps he suggests leaving those posts unfilled, increasing stress and sickness levels on those remaining? I loved my job. I loved doing what I did but the increased stress levels I experienced and the reasons I applied for another job were directly related to the reduction of staff in the team in which I was working. I felt we were teetering on the brink of providing a safe service. This will get worse, it seems and Pickles seems to be condoning it. And similarly he talks about cutting agency staff used. See above. The team I worked in lost a number of team members who weren’t replaced. Agency staff were brought in to cover at a higher cost because the risks were too high. Had there been more planning initially, this would not have happened. This is what does happen when quick cuts are requested and demanded. Longer term costs. Then we get onto the ‘scrap trade union posts’ nice little ‘saving’ he suggests. Yes, really. I am appalled by this. In the light of the amount of redundancies he is asking for, union membership and time is absolutely crucial. Does he really think that these cutting measures will engender a more efficient staff team with poor morale. I am a passionate trade unionist and this panders to the general government agenda of chipping away union power as does another of his suggestions to ‘charge for collecting trade union subscriptions’. And he suggests they councils ‘stop translating documents into foreign languages’. Oh, that’s an easy target. He says this affects ‘community cohesion’. No, it further alienates those who don’t speak or read English. Statutory services are just that and restricting information to those who may not understand English is another way to marginalise other communities. This is downright dangerous as far as I’m concerned. He talks about ‘ending lifestyle and equality questionnaires’. Because these are ‘intrusive and unnecessary’. I can’t speak for all of them but saying that ‘councils do not need to spend time and money on Equality Impact Assessments’ says where his priorities lie. True that I’ve seen some awful Equality Impact Assessments in my time but I’ve also seen Trade Unions in particular challenge them when they have been poor to good effect. Getting rid of them completely isn’t ‘the answer’. We get onto a nice, snappy ‘sell services’ suggestion which I feel is at the core of the government’s agenda in relation to local authorities. This government WANTS skeleton local authorities that provide little to nothing directly. Private and voluntary sectors may move in for the more profitable services and some ‘social enterprises’ might pop up which can pick up the slack in areas like adult social care – but the terms and conditions of employment for staff will be poorer – as will the democratic accountability. I have now left local government service but my heart is lingering on because I know what those services which are being decimated mean to people. Maybe not to Pickles and his ilk in the Cabinet but to some of those who have the highest needs. My concerns is that adult social care cannot sustain many more cuts although obviously that varies from area to area but Pickles wants to detach services from the auspices of local authorities and that’s dangerous language. There is scope for saving in better commissioning of services and better monitoring of services commissioning. My experience within local government is that the channels of communication have been weak. As a social worker in a local authority I felt very much at the periphery of the organisation – possibly because I was also seconded out to the Mental Health Trust – but I could have been and my ex-colleagues could be a valuable resource in terms of seeing where a lot of the waste and benefits could come from. If I were writing to a local authority a guideline for saving I would probably share Mr Pickles’ last point. Speak to your staff. Speak to all of your staff. Your staff may be your residents. They may be on the periphery of the organisation but they may also see things not apparent at director level. Value them and promote engagement with unions rather than isolating them because good staff can push improvements. As for Pickles, his document is as much of a farce as his ripping to shreds of the funding streams for local authorities.